Location: Situated at S end of Nanternis alongside by-road (E side) with cemetery to rear. Built 1867, but still in late Georgian style and plan. The first members came from Capel-y-wig (Llangrannog) and Penrhiwgaled (Llanllwchaiairn). Early C20 embellishment of facade. Pebbledashed lateral front with smooth rendered quoins and lugged/shouldered surrounds to openings with keystones (early C20 detail) Slate roof, projecting eaves and bargeboards. Two long round-arched 28/20-pane hornless sash windows to centre with radiating upper glazing and narrower glazing towards centre: the main arched pane of both windows has coloured and etched glass depicting the Lamb of God, coloured flanking panes. Smaller arched 13/10-pane hornless sash window to first floor of each outer bay: glazing bars as above. Slate sills. Round-arched matching doorways to each outer bay, both with boarded door and 9-pane fanlight having radiating glazing. Plaque between long windows within rendred panel reading: "Nanternis. Adeiladwyd yn y Flwyddyn 1867"
Blank left end. Rear with two 30-pane sash windows to each storey. Schoolroom of 1923 attached to right end. Large cobbled forecourt, rubble boundary walls with railings and central gate. Three-sided gallery, long raised and fielded panels to front with moulded beading. Plain iron posts (cast by Thomas and Co. of Cardigan). Painted tiered seating to gallery with ramped ends. 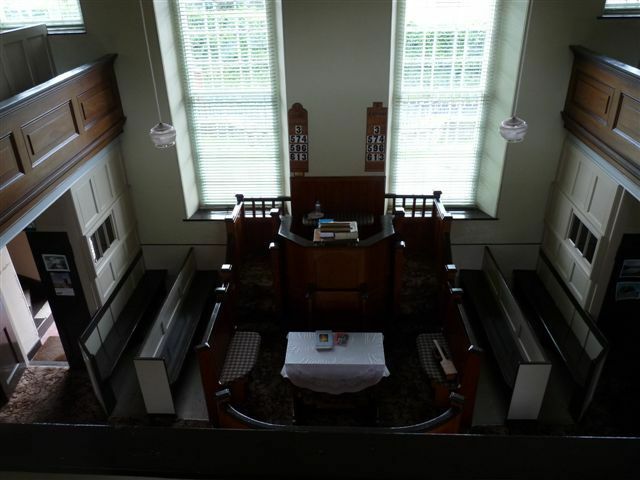 Twin lobbies, pulpit between with polygonal panelled front and flanking stairs; the panelled balustrade of these continue to form the sides of the Big Seat. Curved pew forms front of Big Seat. Painted tiered pews with ramped ends and panelled backs. Ceiling coved on long sides, centre part boarded and ribbed with octogonal wooden ventilator and radiating ribs. Well proportioned later C19 chapel, showing the late survival of the lateral-front plan in rural West Wales. Unusual stained glass. Chapel situated at S end of Nanternis with front walls, gates and rails forming the road boundary and containing large cobbled forecourt. Situated in village centre on W side of by-road on steep bank. Situated in village centre on E side of by-road. Situated on W side of by-road, 1.3km NW of Nanternis. Reached along short drive. Situated on W side of by-road, 1.3 km NW of Nanternis. Situated near end of lane, E of Cae'r-llan.